NOTE: Knife is not included. 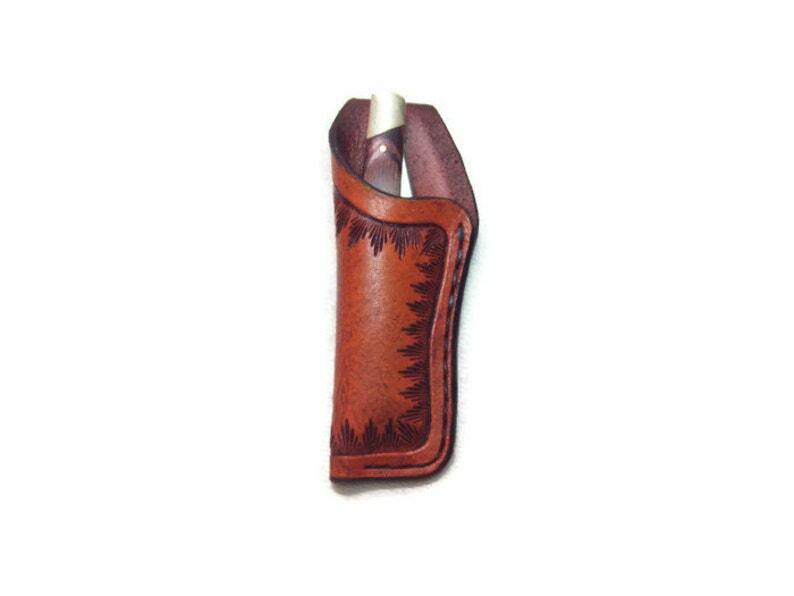 This is a custom leather VERY SMALL knife case / sheath for a SMALL pocket knife. It features: Premium carving leather, hand stitched 1 1/2" belt loop, hand tooled grass border design, hand rubbed finished edges, and recessed hand stitching. (Stitching is guaranteed for the life of the item). Available in Black, Chocolate Brown, Saddle Tan (shown), Mahogany, Natural Leather with natural edging, or Natural Leather with black edging. A color chart can be found by scrolling through the photo's. Fit's small pocket knives, mini tools, and Swiss Army knives up to approx. 3 1/4" L x 3/4" W x 3/8" thick or 3 1/2" L x 5/8" W x 1/2" thick. Knives that fit this sheath nicely are: GEC Penberton, Buck 379, Buck 505, Case Peanut, Case 6327, Case 6220ss, Uncle Henry LB3, GEC #9 Esquire, 3 1/4" Alox Swiss Army Knife, and like knives. If your unsure about the fitting, please ask as I am always happy to help. Will ship in 7-14 business days. Quality made in the USA! Fits like a glove for my Nontron penknife No.12, which is 9cm closed (has a stainless steel 7cm blade), and has a fixed ferrule and a clog boxwood handle with woodburned figures. Thanks.